This article will guide you on how to set up the Linksys SPA-122 ATA device on bridge mode. NOTE: This procedure is used to troubleshoot the lack of internet connection on ATA devices. Determine the IP address of your Linksys SPA-122 ATA device. Plug in an analog phone to the Phone 1 or Phone 2 port. Make sure it has an active DigitalLine. Dial **** and you will hear the Cisco Configuration Menu. Dial 110# to obtain the IP address of your Linksys ATA. Access the Linksys SPA-122 ATA Graphical User Interface (GUI). Enter the IP address into your browser. • Recheck your IP address. 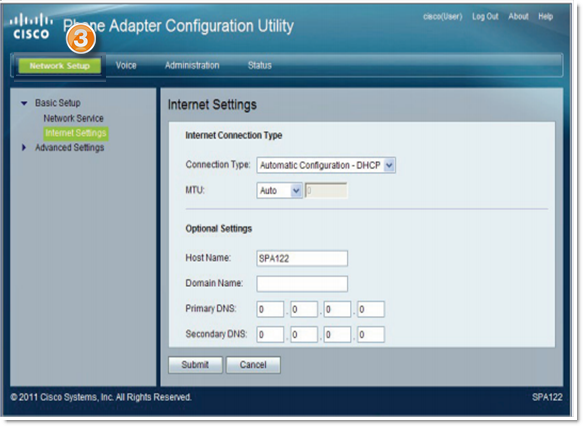 • Plug your PC or laptop directly into the ethernet port of the ATA and type in the IP address. • Go back to the IVR and dial **** from the phone connected to your ATA, then dial 7932#. Dial 1 to turn on the web interface. NOTE: The default username is either admin or cisco. The default password is either blank, 72227, admin, or cisco. If you are not able to access the GUI, the device is most likely locked. Under the Basic Setup menu, click the Network Service sub menu. Under Network Service option, select the Bridge option in the drop down menu. As best practiced, please do a sequence power cycle on all the devices — Linksys SPA-122 ATA and the devices involved. You have now set up your Linksys SPA-122 ATA device on bridge mode.